I consider myself a writer, but putting together a logline has been more frustrating than writing an entire screenplay. How can a single sentence be so hard to write? I read up on loglines online and followed all the advice I could get. I’ve tried countless versions, but I don’t like any of them. There’s just no way to capture my entire screenplay in one sentence. And when it comes to submitting queries, I’m trying everything to grab readers’ attention, but I keep getting closed out. Do the readers out there not know enough to recognize a great idea when it’s right there in front of them? I feel your frustration dude, I really do. There’s nothing worse than a gnarly day at the beach, stuck in the froth when you’d rather be in the pipeline, charging for shore. But here’s the truth. It’s not them. Evaluating ideas for movies is what “they” do for a living. It’s either your logline or your idea. Ouch! Sounds as if you’ve taken a pounding. Find professional help from the Big Ideas Free Thumbs Up Or Thumbs Down for pro feedback on your logline and your concept. So is it your surfboard or is it your technique? 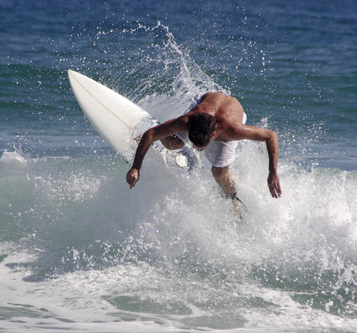 You can figure out if you’re getting worked by a wave because of your concept or because your logline. If it’s your idea that’s causing you to get blown out it’s easy to check it out! Just as you have people read your script and give you feedback, you logline deserves the same time and attention. Will anyone else feel the way you do about your idea? If it’s only of interest to you then there’s no audience for the movie. The great thing is that EVERYONE is an expert on movies. Your consumer is literally all around you. Get your feet wet! Pitch it to your friends, your partner, your writing group, kids – who are brutally honest, strangers in coffee shops who are not in the midst of cranking out their own scripts, someone you meet on a blind date. Not your Mom, because she loves everything you do, sweetie! Remember, you know the story inside and out. Test your logline out on people who, like its intended recipient, have never read your script or heard a pitch. You can tell them your logline and a very short pitch – just a few added sentences. Then ask them to tell the story back to you. Did they tell your story? Ask them what the hero is like? What kind of person are they? Ask what’s the biggest problem the hero faces. Can they tell you what will happen if the hero fails to conquer that problem? Did they truly want the hero to succeed? Can they tell what audience the movie would appeal to? Kids, teenage girls, young men, women? And here’s the biggie. Ask if they could tell what the movie feels like – it’s genre and tone. Can they tell you honestly if it was a movie they would want to see or not? It’s okay if it’s not a movie they want to see; not every film appeals to everyone, but they should be able to decide. That’s what your reader will be doing. If your Focus Group can’t answer these questions, the readers of your loglines can’t either. I advocate taking a logline for a test drive before you ever begin to write a screenplay. You’re going to commit a ton of your time and your creative juice – your most important resources – to this idea. Shouldn’t you do some market research first? If your logline has passed the Idea Test Drive with flying colors, then it’s time to consider that you might be writing it wrong. 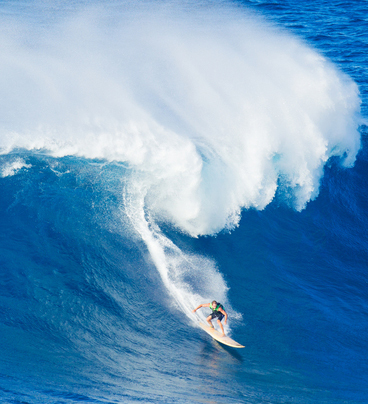 Don’t get obliterated by the next big wave. You’re gonna need a great board and some rad pro techniques. The advice among online writers’ groups is all too often the blind leading the blind. There’s usually a lot of obsessing about word count and, for some reason I don’t understand, commas. Get the real scoop on whether word count counts here. The short taglines that are used to entice moviegoers into theatres are not enough to entice your reader into asking for your script. They may be pithy, but they don’t tell the story. Taglines are created by studio marketing departments in hopes of generating buzz. You’re not at that point. Your goal is generating interest in reading your script. For that, you need a real logline. Save the taglines for the marketers selling your movie. Focus on selling us on reading your script. There’s no question about questions. Well, most of the time they don’t work. I once set up a project at Warner Brothers that began with a question, but immediately gave an answer, and then a full logline, plus treatment. And it’s a damn good question and answer that tells you a lot about the tone of the movie, fills your mind with possibilities, and makes you want to know more. It’s provocative. But don’t try this at home, kiddos. You may be convinced that questions grab interest, but this is just a cousin to the tagline, a teaser not a story. Professionals are starving for stories. That’s how to grab us. Worse still is trying to engage the reader by putting him in the shoes of the hero, “What would you do if…?” More than ineffective, this makes you look like an amateur. Avoid at all costs. Avoid character names in loglines. Unless it’s real people, and then only well known, public figures. If that’s the case, there’s no sense pussyfooting around with the awkward “Thirty-seventh President of The United States, when you can say RICHARD NIXON. And when you use a real person, I believe in putting their names in all caps, as you would do in a script when introducing a character. You might think that you need character names to keep your logline clear, but you should be using adjectives to differentiate them. Prove you can put together sentence. Guess what? This is a writing sample. Your first, best and often only opportunity to show us that you can write. The writing you should be strong and lean. Spelling, grammar, punctuation and clear, communicative writing COUNT! If you can’t write a perfect sentence, why would we consider suffering through 110 pages of sloppy writing? While not 100% of your grade, they can really help boost your idea when they are a perfect fit with your story. Great titles are like that “Eureka!” moment. They don’t come along often, but when they do they are sublime. Legally Blonde? Genius. The Usual Suspects is a perfect fit for the movie, and a clever reference to the classic Casablanca. What makes them great? A great title reflects the tone of the movie. A comedy with some humor in the title is sublime. Don’t be afraid to lean on a working title, just as long as you can stay open to other possibilities. Keep brainstorming until you find your “Eureka!” moment. I hope these tools help you figure out if it’s your idea or your logline that is causing your wipeouts. Time to pick yourself up, grab your board, and get back in the water. ← The Logline Dilemma – Does Word Count Count?